The University of Glasgow’s Institute of Cancer Sciences undertakes research of international quality directed at key aspects of cancer cell behaviour with the ambition of forging new therapies and diagnostic tools to help cancer sufferers. The University has identified cancer as one of its key strategic themes and there has been major investment into cancer research over the past decade (including substantial investments from the Wolfson Foundation). In 2008 the Foundation awarded £1.75 million to help create a new building focussed particularly on translational research: the Wolfson Wohl Cancer Research Centre. The new project was thus the next stage of development of the Beatson Research Facility on Garscube Estate, on the north west side of Glasgow. Woolgar Hunter were appointed as Civil & Structural Engineers, working with RMJM Architects. 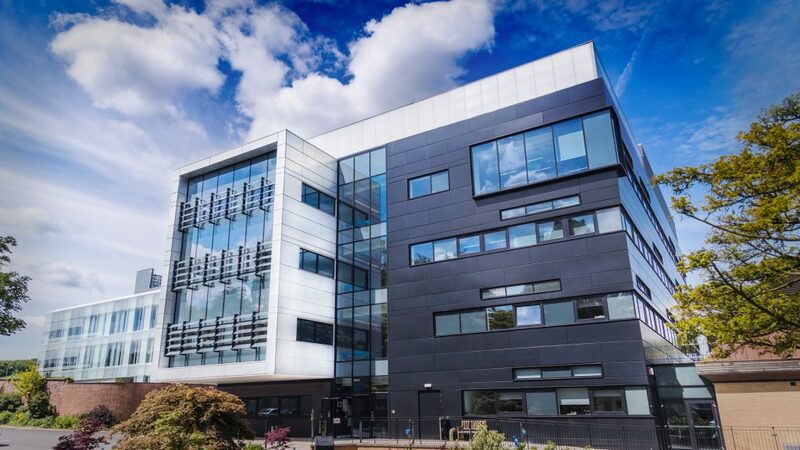 The new building provides state of the art, flexible laboratory and research space over five storeys, on the site of an existing lab building which was demolished. As with most laboratory projects, the highly serviced building required close coordination between the design team to establish an appropriate building plan and sections. Structurally, an innovative post tensioned flat slab floor structure was adopted, providing total flexibility for horizontal services distribution. We designed the post tensioned slab act ‘compositely’ with a 75mm concrete screed, thus creating a suitably robust slab which meets the stringent vibration response limits required for the sensitive building use. The concrete construction also provides inherent fire protection and acoustic insulation, which eliminated the requirement for costly spray-on or boarded fire protection systems or acoustic ceilings. In addition, the air tightness requirements outlined in the Building Standards were more easily achieved with the concrete frame, avoiding the need to install costly wall to slab junction details. The foundations were piled due to poor ground conditions and the construction required careful consideration due to its proximity to existing laboratory buildings. The bored piles specified were installed with minimal noise and vibration, were constantly monitored and compared with acceptable limits to prevent disruption to the neighbouring occupants. The new Wolfson Wohl Centre opened early in 2013.